Rhythm has teamed up with Download to offer one lucky winner a pair of weekend camping tickets for the mega festival. And this is one weekend of music that you don't want to this. 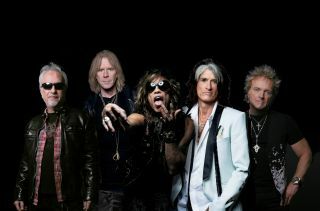 Headliners for 2014 will be rock juggernauts Aerosmith, Avenged Sevenfold and Linkin Park - giving a rare performance of their debut album Hybrid Theory - with main support coming from Alter Bridge, Rob Zombie and Fall Out Boy. Joining these rock galácticos will be dozens of other amazing acts including Status Quo, The Offspring, Trivium, Steel Panther, Bring Me The Horizon, Twisted Sister, Within Temptation and many, many more. Situated in the bubbling atmospheric cauldron of Donington Park Race Track, Download offers some of the most exhilarating live music experiences, camping shenanigans and after-hours madness on the festival circuit. To stand a chance of winning a pair of weekend camping tickets for the festival, just send your answer to the following question (with the subject line 'Download') to rhythm@futurenet.com before 30 May. Slipknot, Iron Maiden and which other band headlined the 2013 Download festival? Keep your eyes peeled and visit www.downloadfestival.co.uk for line-up updates and more info on the festival.